These workshops are supported by the Scottish Government and the Improvement Service. The main aim of hosting these events is to improve knowledge sharing and networking between community council representatives. They also provide an opportunity to showcase (1) the Scottish Government’s work on Community Empowerment, (2) the Improvement Service’s work on the KnowledgeHub and the national web site for community councils, and (3) how community councils might use digital tools for participatory budgeting. The first two workshops took place in Ayr on 9th October 2015, and in Elgin on 30th October 2015. 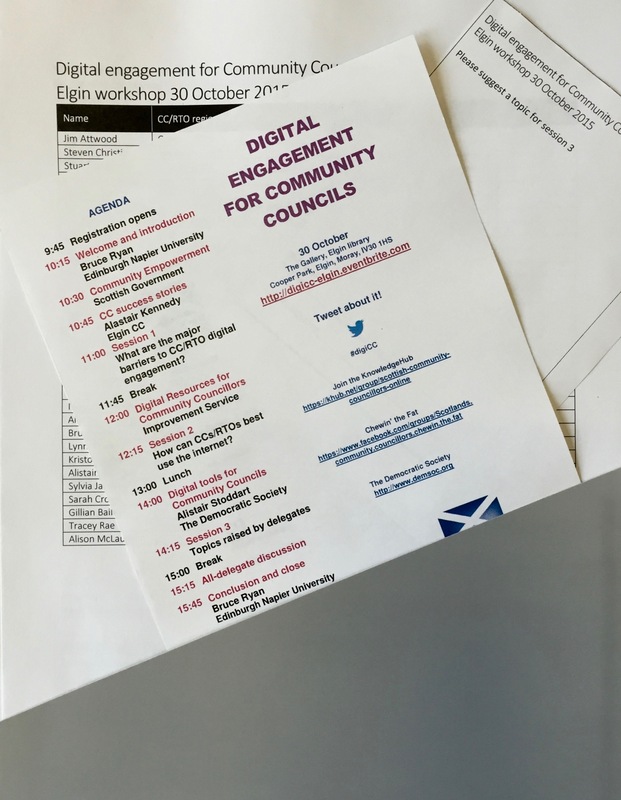 In order to build up a profile of the sector we asked the delegates at these workshops to tell us about the extent to which their community councils use technology for digital engagement. To date we have found that the majority of community councils are not online. In cases where they do have an online presence, Facebook is the main digital engagement channel, and this is used primarily for planning, and advertising local news and events. The individuals who have taken it upon themselves to maintain online presences for their community councils are mostly self-taught, and often left to do this work in isolation. Very few are confident that when the time comes for them to step down that the online presences of the community councils that they have built will endure. The main barriers to fuller digital engagement relate to a lack of knowledge and skills, fears related to the adoption of social media (for example, legal liabilities and data protection), costs of maintaining an online presence (primarily time), and poor broadband connectivity in some rural areas. Nevertheless, delegates at the first two workshops recognise how community councils can use the Internet for a variety of purposes. These include: maintaining presences on projects/key issues (for example, community asset transfers); storing and sharing documents and information (especially on planning); linking with nearby community councils and other relevant organisations; and facilitating discussions with the wider community, especially younger people. The next two workshops will be in Forfar on 13th November and Newton St Boswells on 20th November. As has been the case at the last two events, the programmes at the next two will focus on promoting networking and knowledge sharing. They will also give us further opportunity to learn about digital engagement across Scotland. Delegates will be also able to meet Scottish Government representatives at these events and discover what it can do to help support Scottish community councils. Participants in Ayr and Elgin reported that they valued the opportunities to network and learn at the workshops, and that in doing so they directly solved some of their digital engagement issues. They have also told us that they have made connections with others with whom they intend to work in the future. If you are interested taking advantage of one of the future sessions in a similar way in Forfar or Newton St Boswells, please register on EventBrite. This entry was posted in CPD, Events, Projects and tagged #digiCC, Angus, Ayrshire, Borders, Bruce Ryan, Centre for Social Informatics, community councils, CSI, digital engagement, Edinburgh Napier University, IIDI, Improvement Service, Institute for Informatics and Digital Innovation, Moray, Peter Cruickshank, Scottish Government by Hazel Hall. Bookmark the permalink.